The Lopi Radiant Plus Small Gas Burning Fireplace Insert is the perfect choice for those small zero clearance and masonry fireplaces. This small gas insert is designed to be installed where most units cannot. Speak to a salesperson today! 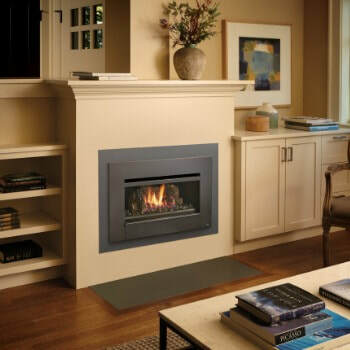 The Radiant Plus Small insert provides radiant heat and natural convection. This unit can heat up to 950 square feet. While the unit is compact, it still features a gorgeous fire display. Choose the best control system for your unique heating and lifestyle with a Standing Pilot (MV) or GreenSmart® Basic (IPI) model options. ​* Will vary with floor plan, insulation and outside temperature.